Middlesbrough's Jelle Vossen battles with Wolves Dave Edwards during the Sky Bet Championship match at the Riverside Stadium. Photo: Owen Humphreys/PA Wire. Jelle Vossen will make his Burnley debut at Accrington Stanley today - the first step on a journey he hopes will lead to the Premier League. Vossen, 26, signed last Tuesday for a fee in the region of £2.5m from Belgian side Racing Gen, having spent last season on loan at Championship side Middlesbrough. 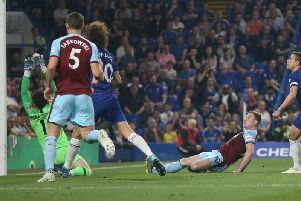 The Belgium international striker finally got international clearance yesterday, allowing him to feature at the Store First Stadium, and after being unveiled to the local media, he spoke of his reasons for joining the Clarets: “Everybody wants to be back in the Premier League as fast as possible and that’s my ambition as well. “We’ll have to work very hard and that’s what we’re doing at the moment. “I’m just doing the preparation in pre-season now and I can’t wait to get the games started. I’m really looking forward to it. “We’ll have to keep up the good work and try to do the best that we can. “We have the aim to get back (to the Premier League) as fast as possible and now it’s up to us to show that on the pitch. Vossen splayed at Wembley for Boro in the play-off final defeat agaimnst Norwich, hitting the bar with the game goalless, and he hopes to use that, and Burnley’s relegation, as extra motivation to reach the top flight: “You have to make every disappointment become extra motivation. That’s something we all have in common so we’ll use that this season. “I’ve got a year of experience from the Championship so that’s a good thing for me as well because I know the league. It’s a crazy and unpredictable league but we know what we have to do and everybody is getting ready to achieve the same ambition now. “It’s quite a physical league and there are no easy games. Every game is a real battle for 90 minutes. Meanwhile, as Sean Dyche looks to add to the signings of Vossen and Matt Lowton, he admits things are moving in the right direction: “There are a couple of things that are gathering pace. “There are a lot of conversations and a lot of aligning. Clubs can often move someone out and get someone in.